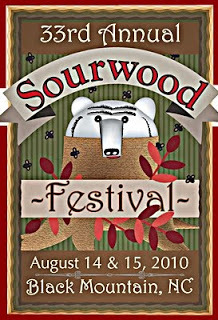 The 33rd Annual Sourwood Festival will be held August 14-15, 2010, in Black Mountain, NC, a charming artsy town that’s just 12 minutes from the Inn on Mill Creek. In conjunction with the festival, singers will compete for cash prizes in the Sourwood Idol contest on Friday, August 13, to be held from 7pm to 11pm under the Big Entertainment Tent on Sutton Avenue in downtown Black Mountain, while early risers can catch a 5K run/walk at 8:30am on August 14, at Cheshire Fitness Club just south of downtown. What is sourwood, you ask? The sourwood tree and our lovely honey bees provide our area with very tasty local sourwood honey (which we like to use in our breakfast recipes, such as the one for Brigette’s fresh fruit honey lime cocktail). The sourwood tree has white blooms in the summertime, and its leaves put on a fiery red color display each autumn. It’s a beautiful tree, worthy of having a festival named after it, that’s for sure! For more details about the annual Sourwood Festival, which also has been included in this year’s events celebrating the Blue Ridge Parkway’s 75th anniversary, visit www.exploreblackmountain.com.